The tea party has outdone itself. In a universe where Nancy Pelosi is the Antichrist in heels, in a political construct where President Obama is a communist Islamic Nazi witch doctor from Kenya who's going to take over health care and force doctors to pull out your fingernails one by one until you retroactively abort your firstborn son and offer his remains to Ted Kennedy . . . it is in this strange, strange world that North Carolinians just might elect to the U.S. House -- with GOP and tea-party blessing (and cash) -- one Ilario Pantano. Ilario Pantano, who used to be a Goldman Sachs energy trader, ended up rejoining the Marines after 9/11, then went on to pump some 60 rounds from an M-16 into the backs of two unarmed Iraqi detainees. Ilario Pantano, whom the Marines charged with murder months later but didn't have enough evidence to court martial. Ilario Pantano, the subject nevertheless of a Marine leadership-manual scenario aimed at teaching unit leaders how not to act on the battlefield, whose actions were described by a lance corporal who reported him as "war crimes." * How should the Marine Corps investigate and adjudicate incidents such as those that occurred at Mahumadiyah may have occurred? 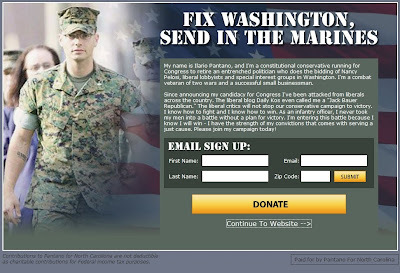 brought forward questions about that Marine’s behavior? * Can an action be lawful but dishonorable? * What do we use as measures of honorable behavior and conduct if the Uniform Code of Military Justice is inadequate or unsuited to the task? THAT'S a hell of a resumé, Hoss. And it doesn't matter to anyone. Most notably, the candidate himself. One might assume that someone who'd gunned down a couple of unarmed prisoners at almost point-blank range might be circumspect about his wartime actions. Especially actions that could have landed him in prison for the rest of his life. One might think that someone in such a position -- who had been branded by more than one of his own Marines as a war criminal -- might come back home haunted and penitent, and aware that he dodged some bullets that two Iraqi men couldn't. You know what they say about what happens when you assume. Republican congressional candidate Ilario Pantano will hold a pistol match Sunday afternoon at the Ant Hill Range in Brunswick County to raise money for his campaign against incumbent U.S. Rep. Mike McIntyre, D-Lumberton. 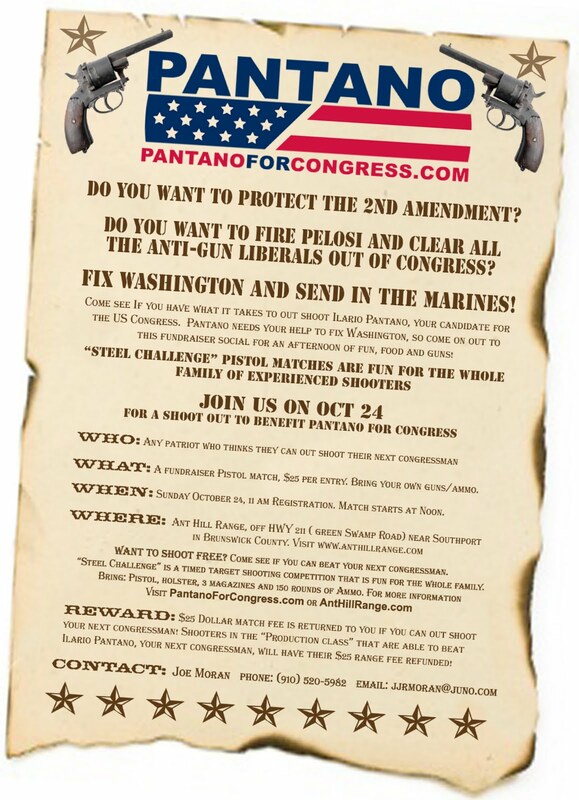 For $25, “any patriot” who thinks he can outshoot Pantano is invited to show off his marksmanship in a timed target-shooting challenge, according to ads for the event. Shoot fast and straight enough to beat the former Marine and trained sniper and get your money back. 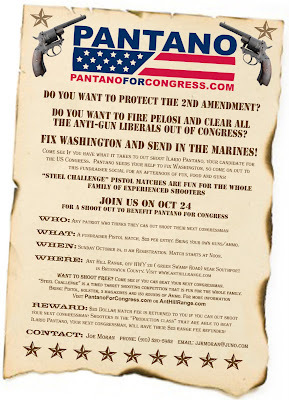 “Pantano needs your help to fix Washington, so come on out to this fundraiser social for an afternoon of fun, food and guns!” according to an advertisement for the event. Registration starts at 11 a.m., with the shooting starting shortly after noon. Shooters can sign up at the event and must bring their own gun and ammunition. At this point, the occupants of the white sedan were described as cooperative; no weapons had been found on either their persons or in the vehicle. The women at the target house corroborated their story. The only finds worth mentioning were the coffee cans of nuts and bolts found in the trunk of the car. The platoon commander directed the corpsman to take charge of the detainees. The corpsman moved them to the rear of the vehicle, separated them and placed them on their stomachs. He stood security on the detainees while the platoon commander and radio operator went to the target house. It could not be determined whether the platoon commander was informed that the residents had confirmed the two detainees’ story. It was determined, however, that the residents had not been held hostage in their homes by insurgents. return, the platoon commander directed the radio operator to get the Iraqis up from the ground and remove the flex cuffs; the radio operator did so using his medical shears. The platoon commander then told the corpsman he wanted the detainees to search the vehicle a second time. The corpsman moved the detainees to the left or west side of the vehicle, placing the older of the two Iraqis in the driver’s door and the younger in the passenger door. The Iraqis had to be told several times to stop talking. security positions, leaving him alone with the two Iraqis. The corpsman testified that he heard the platoon commander say “stop” in Arabic and then again in English. He then heard shots being fired. The platoon commander fired two thirty round M-16 magazines into the two Iraqis using burst fire. The corpsman has testified that the platoon commander fired from a distance of four to five feet. The corpsman turned during the firing and observed the platoon commander’s rounds striking the Iraqis in their backs. He saw the Iraqis slump into the vehicle. The radio operator immediately faced about and saw the platoon commander firing into the vehicle. After the platoon commander ceased firing, the corpsman checked the Iraqis’ vital signs and informed the platoon commander that they were dead. Prior to this firing, the only other shots that had been fired were the warning shots to stop the white sedan. The corpsman testified that throughout this entire action, the platoon had not received any fire. Elements of 3rd Platoon were established to the east, west, and north of the scene of the incident and others were at the target house. The corpsman testified that after shooting the two Iraqis, the platoon commander used his K-bar and rifle to break windows and lights of the white sedan and to flatten its tires. The radio operator also testified that the platoon commander did this, although he testified that it happened before the shootings. The Intel Bn Marine testified that he heard the shots and went back towards the location of the white sedan. During this time, a second vehicle approached the scene from the north. The platoon commander ordered that vehicle, a brown sedan with several Iraqi laborers, to stop just north of the white sedan. commander ordered Marines to move the new detainees to the north of their vehicle. (There were five or six Iraqi house painters in the vehicle. Painting equipment was found in their car and in the house where they had been working.) They were probably twenty feet from the two dead Iraqis. Here, the Intel Bn Marine and his interpreter questioned them. The interpreter testified that the platoon commander had him tell the painters that “if any of them want to join the insurgency that same thing was going to happen to them as those bodies” and then they were released. They drove away on flattened tires. the left side, the same side as the deceased Iraqis. It read “No better friend, no worse enemy.” The first vehicle was not searched again. No effort was made to recover the remains of the dead Iraqis. PERHAPS THAT ought to be Pantano's campaign slogan: "No better friend, no worse enemy." Wink. Lots of politicians will stab you in the back. The would-be congressman from North Carolina might be the first, though, to empty two clips into it. How ironic that Ilario Pantano went off to war to -- What was the official reason at the time? -- "to disarm Iraq, to free its people and to defend the world from grave danger." That was from President George W. Bush's televised address to the nation at the beginning of hostilities. "In this conflict America faces an enemy that has no regard for conventions of war or rules of morality." AS IT turns out, Saddam wasn't alone in that regard. The society he grew up in was violent and well armed. Some accounts say Saddam was given his first firearm at the age of eight. Another has him, at the age of ten, threatening to kill a school teacher who wanted to expel him. But, much more than violence, tribal loyalty was the overwhelming characteristic of the society into which he was born. He was to rise to power not by becoming prominent in politics or the military, but by harnessing the ties of kinship. One of the rebel officers who led the 1963 Baathist coup was Ahmed al-Hassan al Bakr, a relative of Saddam's. Bakr became prime minister and it was under his leadership that Saddam's stealthy seizure of power began, beginning with the building of security and intelligence networks answerable - and loyal - not to the state but to Saddam in person. For five years after 1963, Saddam Hussein lived on the fringes of the new political establishment, frequently falling out of favour and ending up in jail. The breakthrough in his political fortunes came in 1968 when a second coup brought the Tikriti clan to power. 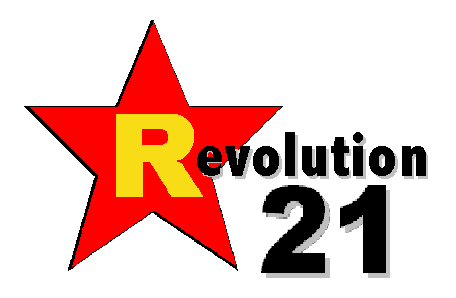 Bakr became head of state with Saddam as vice-chairman of the Revolution Command Council. he systematic violence and intimidation that was to keep Saddam in power began. Possible opponents were assassinated. The Kurdish political leader Mahmoud Osman got to know him well during this period. "He told us, 'You have to kill some people, even if they are innocent, in order to frighten others'." In the 1970s, Saddam Hussein, as Vice President, became head of Iraq's nuclear energy programme. In 1975 he made one of his rare trips abroad - to Paris - to visit the plant that was to supply Iraq with its first nuclear power station. He was welcomed in person by the then French prime minister, Jacques Chirac. Iraq and France signed an agreement which bound Baghdad to the terms of the Non-Proliferation Treaty; the plant would be for the production of energy only, strictly non-military. In 1979, Bakr, in poor health, announced his intention to step down and hand power to Saddam. Some members of the RCC objected and demanded a vote. They did not live long. Saddam accused his fellow Ba'athists of conspiring against him, and of plotting with foreign powers. A meeting of the RCC was filmed in which Saddam is shown denouncing the alleged conspirators and being persuaded by terrified acolytes not to be lenient. Between a quarter and half the members of the ruling body were executed. It was at this time, too, that another distinctive feature of the Saddam regime emerged - a willingness to punish not only direct opponents and potential opponents, but members of their families as well. And now, a tangible symbol of the putridity oozing from an infection America picked up during an unnecessary war is on the cusp of election to Congress. Our Congress. The United States Congress . . . as opposed to its Iraqi counterpart. Or the old Communist central committee of Soviet times. But one of the remarkable things about the campaign in North Carolina this year is that the murder charges are not only not an issue, but have barely even been talked about. David McLennan, a political scientist at North Carolina's Peace College, told Salon that the issue could backfire for McIntyre, the Democratic incumbent, particularly in a district with a large ex-military population. "There are some people in the district who consider Pantano to be a hero. For McIntyre to raise that issue is just way too delicate," McLennan says. Some of the only criticism of Pantano's past has ironically come from the man he beat in the GOP primary, fellow Iraq war vet Will Breazeale. He told the Daily Beast after his primary loss that he considers Pantano "dangerous," adding: "I’ve taken prisoners in Iraq and there’s no excuse for what he did." Asked by Salon if he is surprised that his critics have largely ignored the Iraq incident, Pantano was defiant. "If they want to question my war effort -- if they think that's prudent, they can go ahead ... I've served my country proudly in two wars." IT WILL be America's great shame if he serves one second in Congress.